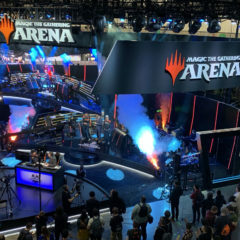 This past weekend Magic The Gathering’s Mythic Invitational at PAX East was the siren’s call… Magic: The Gathering is aiming to be an esports powerhouse. With $1,000,000 Prize Pool and 64 invitees ranging from content streamers on Twitch, Magic Pro League Players, and the top 8 from Magic: The Gathering Arena, along with streaming the whole tournament across four days on Twitch, this is not a moment to be taken lightly. Now, I’m not new to Magic, but I am new to Magic Arena. I’ve only been playing online for a few months, due to the fact that I once tried Magic Online and it felt like a more expansive version of Shandalar. That’s what Magic: The Gathering’s Power Nine is all about; a nonuple of six Artifacts, two Sorcery cards, and one Instant. All nine of the Power Nine were printed in Alpha, Beta, and Unlimited before going out-of-print and into Magic: The Gathering Lore, forever. Back in 1997, two of my worlds collided, when Wizards of the Coast and MicroProse came together to release Magic the Gathering: Duel of The Planeswalkers, also known as Shandalar. One of the most well known mascots in “Old School Magic,” is the Stuffy Doll, created by Richard Thomas. It was on the art for Black Vise, Cursed Rack, The Rack, Leshrac’s Rite, and Wall of Wonder long before it came out as its own card on Oct. 6, 2006 in the Time Spiral set.